A decade ago, the dwarf warrior Akina left her home in the Five Kings Mountains to fight in the Goblinblood Wars. Now, at long last, she’s returning home, accompanied by Ondorum, a silent companion of living stone. But once you’ve traveled the world, can pastoral pastimes and small-town suitors ever be truly satisfying? Adding to Akina’s growing discomfort is the fact that her mother has disappeared into the endless caverns beneath the city. In an effort to save her, Akina and Ondorum must venture below the surface themselves—and into a danger greater than they could ever have imagined. Josh: Well, it’s actually pretty varied. I write across multiple genres (and subgenres), including fantasy, epic fantasy, urban fantasy, sword and sorcery, science fiction, horror, humor, pulp, and mixes of all those and more. I’ve got two novels debuting this year, I’ve published a couple dozen short stories and flash fiction pieces, and I also freelance for a number of RPG developers and publishers. So I like to write across as many formats and styles as possible. 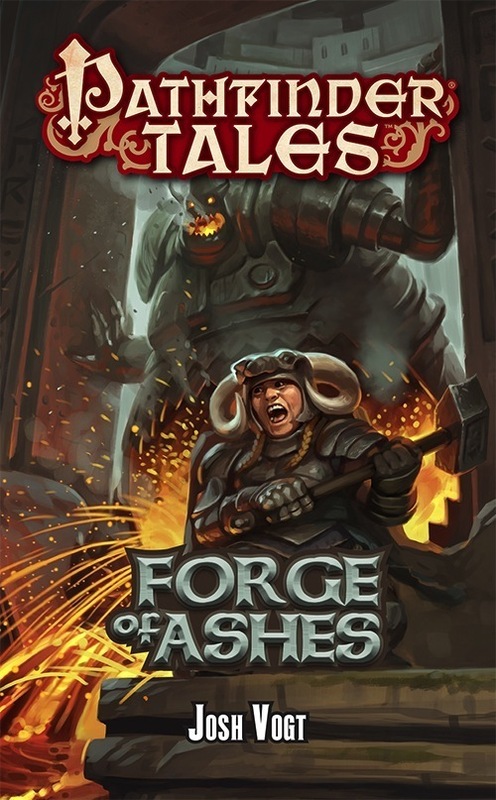 Josh: Forge of Ashes is set in the roleplaying world of Golarion, from Paizo’s Pathfinder world. I’m a bit torn by this question because, while Golarion is an incredibly dangerous reality, it’s also exceptionally fascinating and colorful. I think I’d like to visit there, to at least get a chance to live in a world of unending magic and adventure—all the while knowing I might get eaten by a troll if I let my guard down. Josh: I wrote Forge of Ashes for several reasons. First, I wanted to break into writing for RPGs, and jumped at the chance to pitch a novel for Paizo when they offered the opportunity. Second, I love writing solid adventure tales, which is much of what Pathfinder is about. I love stories that are a mix of fun and thrilling and have a fair share of action in them, so that’s what I set out to write here. Josh: The main character, Akina, is a dwarven barbarian with a bit of a temper. Yet as I wrote more of her journeys, it surprised and delighted me to discover more of the depth she held as a person. She may not have a softer side, in the traditional sense, but she cares greatly for certain people in her life and will fight for them to the very end. She struggles to retain a sense of self and purpose in a world given over to violence and endless struggle for survival. These realizations helped bring her much more to life in my mind. That they’re on a dangerous adventure full of monsters, magic, and mayhem. That there’s always something around the corner, likely waiting to eat them. I hope it can leave some people a little breathless, like in the aftermath of a battle. Josh: One of the issues in the story is Akina confronting her brother’s wayward lifestyle, often getting drunk and generally making a mess of himself. Yet at the same time, she tends to lose herself in a battle fury, getting intoxicated with violence and bloodshed. I tried to parallel these two dynamics, showing how each of them is, in a way, addicted to unhealthy coping mechanisms while ignoring the underlying issues that drive their negative behavior. It was an experiment to show how different people can struggle with similar problems in both internal and external ways.